I have been really trying to up my mom-game this past week. My goal was to have dinner ready for my family most nights, and not have to order in or go to a restaurant. My inspiration came while I was reading back through some of my ancient blog posts, and came across one where I made 12 pounds of chicken in one night (don’t judge my terrible photo!) while I had a 3 week old Baby L in a baby carrier. Seriously, what was I thinking?! Shouldn’t I have been sleeping or something? I had a 14 month old and a 3 week old. Jeez. Anyway, back to upping my mom stats…. Basically, if I could cook back then, I better be makin’ some awesome dinners now! I was taking inventory of my fridge one day this week, to find out what food needed to be cooked before it had to be tossed. So, that’s what I threw into this meal, and it turned out pretty fabulous, if I do say so myself. Not to mention, I get a Gold Star for being really resourceful with the food in our fridge. The whole family enjoyed this dinner, and it will go down in history as “The Day Without Any Leftovers”, which makes me one very happy mama! Throw all ingredients into your slow cooker (except for the extra milk, water, and shredded cheddar cheese). Let it cook on high for 2-3 hours depending on your heat settings. Check on the progress of your meal after that time. Then, stir the food to thoroughly mix. Use a fork to shred the chicken until completely shredded and mixed in with other ingredients. The food will look like the picture above. This is where you’ll add in the extra 2 cups of milk, 2 cups of water, and shredded cheddar cheese. Mix up the corn chowder and recover the slow cooker. Let it simmer for about 20 more minutes on high. Enjoy this delicious corn chowder over bread or in a bowl. 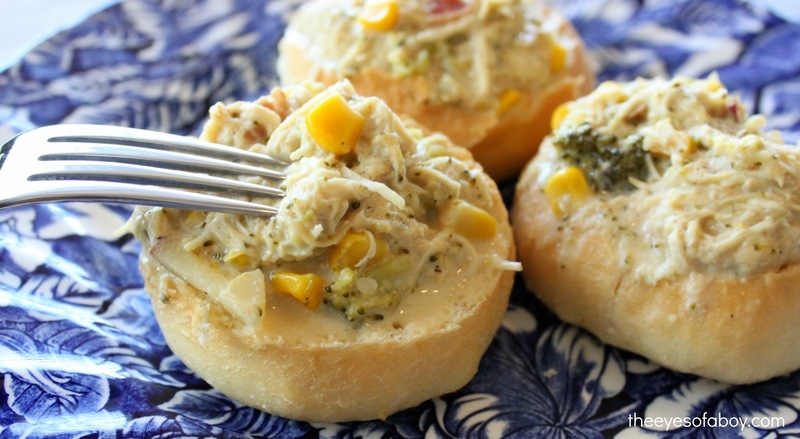 Served over mini bread bowls would be perfect for a party, and surely please your guests. If you’re just looking to please your belly, pour the chowder into a bowl and get to work! FYI – I chose the mini bread bowls because I like carbs a little too much. 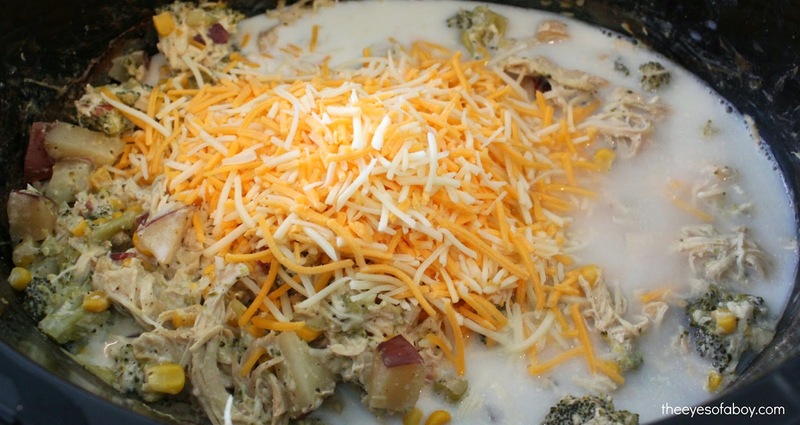 Add all ingredients into slow cooker (except for the extra milk, water, and shredded cheddar cheese). Cook on high for 2-3 hours depending on your heat settings. Check on the progress of your meal after that time. Then, stir the food to thoroughly mix. 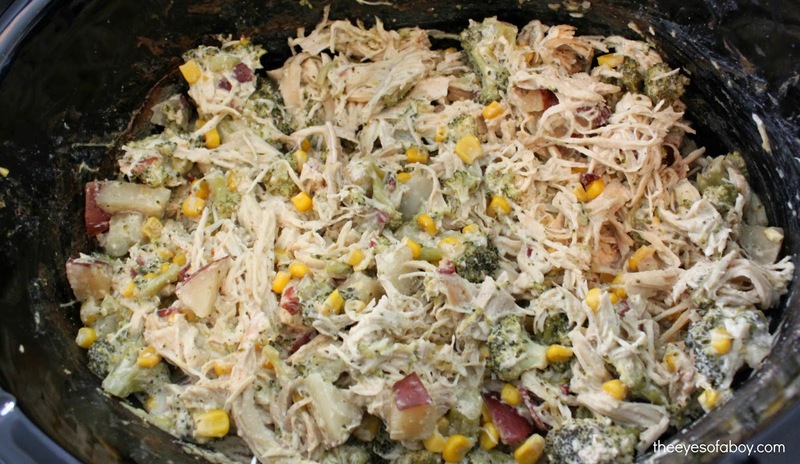 Use a fork to shred the chicken until completely shredded and mixed in with other ingredients. Add in the extra 2 cups of milk, 2 cups of water, and shredded cheddar cheese. Mix it up and recover the slow cooker. Let it simmer for about 20 more minutes on high. I&#39;ve never had chowder before. It kind of looks like a stew. This recipe sounds pretty good. And, a creative way to use leftovers. This looks amazing! Such a great meal especially during the winter time. Any type of slow cooker meal is perfect for the winter time! I love using the slow cooker in the winter. When I first glance at the recipe title I thought it would be a piece of work, but actually it looks pretty simple, and certainly would accomodate using other leftovers too. Thanks for the post. Wow, about to pin this one, it sounds SO good and looks delicious. Think it would be ok over biscuits? 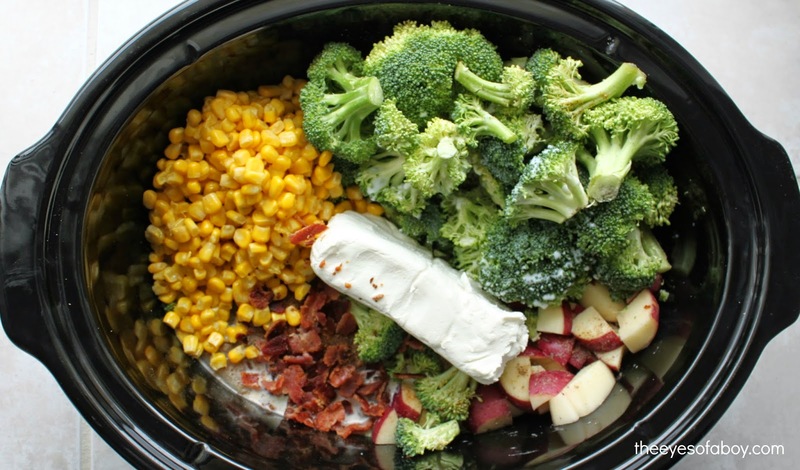 I am always looking for good crock pot recipes – and THIS is one that our family will love! – for those COLD Florida evenings! Thanks for sharing – and kudos to you for using what you had in the house! 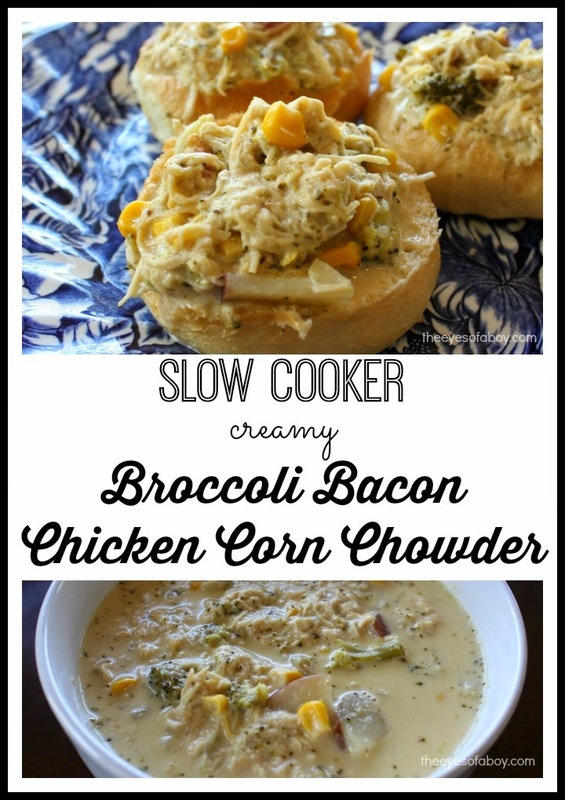 I love a great Creamy Broccoli chowder, but never had It like this, this looks so delish. Great way to warm up here in Michigan cold weather. Adding this to my favorites. This looks amazing! I love crockpot recipes! This looks easy and delicious. My kids love all kinds of soups and chowders so I&#39;ll try this for them. I cannot wait to try this recipe. I am always looking for new recipes to try. Thanks for sharing. Holy amazing! I made corn chowder over the summer, quite delicious if I do say so myself, but I MUST try your recipe! I love how you just throw is all in and let it cook. I love cooking in my crock pot. This recipe looks super simple. I can&#39;t wait to try it out. I love corn chowder, and this looks delicious. I cannot wait to give this a try. Thank you for sharing this recipe. This looks like an easy dish to make and looks so delicious! Wow, sounds so good! 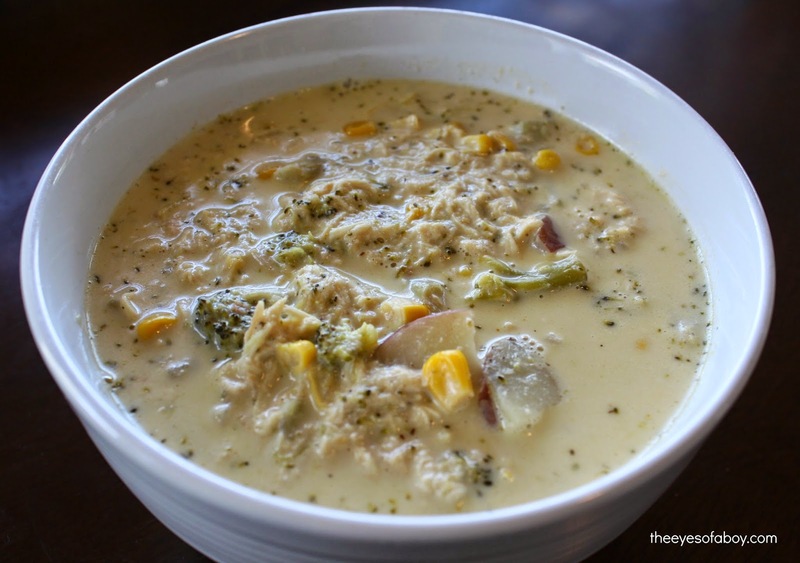 I love a good corn chowder &amp; this looks easy to make. Thanks for sharing. This recipe looks so easy to make and looks and sounds sooooo YUMMY! I cant wait to try it out thanks for sharing this. I am pinning so I can find it easier. 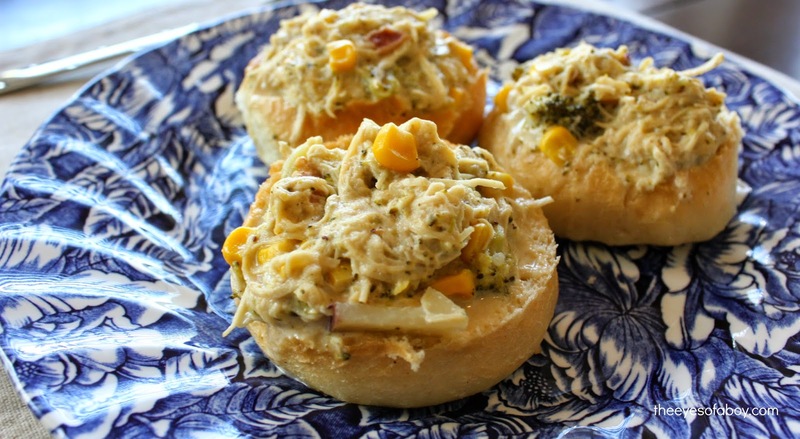 This looks really yummy and I love meals that are made in a slow cooker. This looks delicious and perfect for a chilly day. I just got a book for Christmas of slow cooker recipes but I think this is better than any I found in there! I really like slow cooker cooking especially in the winter. It is comfort food and on cold days tere is nothing better. I liikke slow cooking too because it usually has everything in it and you know whats in it from vegatables to proteins.